On this episode, Mary Wilson reads “The Bottom Line” by James Grady. “The Bottom Line” was originally published in the anthology D.C. Noir, edited by George Pelecanos. James Grady is the author of the classic thriller Six Days of the Condor, which was made into a movie starring Robert Redford and Faye Dunaway called Three Days of the Condor. He’s written more than a dozen other novels, including Last Days of the Condor, The Nature of the Game, and Mad Dogs. On top of all that, James Grady is also a heck of a nice guy. On this episode, Mary Wilson reads “Autumn at the Automat” by Lawrence Block. The Edgar Award-nominated story “Autumn at the Automat” was originally published in the anthology In Sunlight or In Shadow: Stories Inspired by the Paintings of Edward Hopper. Lawrence Block is one of my literary heroes. He’s published more than 100 books, including novels about Keller, a hitman who collects stamps, about Matthews Scudder, a cop turned private investigator, and about Bernie Rhodenbarr, a gentleman burglar, among many others. He’s a Grand Master of the Mystery Writers of America. He’s won the Edgar and Shamus awards four times each, the Japanese Maltese Falcon award twice, and the Nero Wolfe and Philip Marlowe awards. Among his many other recognitions is the Edward D. Hoch Memorial Golden Derringer for Lifetime Achievement in the short story. And he rides the train whenever possible. Lawrence Block is cool, and his writing is amazing. On this episode, Mary Wilson reads “A Nice Pair of Guns” by Nick Kolakowski. “A Nice Pair of Guns” was originally published by Thuglit. Nick Kolakowski is a writer and editor. He’s the author of the short story collection Somebody’s Trying to Kill Me and the humorous How to Become an Intellectual: 100 Mandatory Maxims to Metamorphose into the Most Learned of Thinkers. His writing has appeared in The Washington Post, Washington City Paper, WebMD, McSweeney’s, North American Review, Crime Syndicate, and many others. He’s also an editor at the great flash fiction website Shotgun Honey. On this episode, Mary Wilson reads “Knockout” by Eryk Pruitt. “Knockout” was originally published by The Flash Fiction Offensive at Out of the Gutter Online and was a finalist for a 2015 Derringer Award. Eryk Pruitt is a screenwriter, author and filmmaker living in Durham, North Carolina, with his wife Lana and cat Busey. His short films FOODIE and LIYANA, ON COMMAND have won several awards at film festivals across the United States. His short fiction has appeared in The Avalon Literary Review, Pulp Modern, Thuglit, and Zymbol, to name a few. His novels DIRTBAGS and HASHTAG are available in ebook and paperback. Eryk’s the host of the radio show “The Crime Scene with Eryk Pruitt” and the Noir at the Bar series in Durham, and his next novel will be published by Polis Books in October 2017. On this episode, Mary Wilson reads “Thoroughly Murdered Millie” by April Kelly. “Thoroughly Murdered Millie” was originally published by Shotgun Honey. April Kelly is an Emmy-nominated television writer and producer. Her debut novel WINGED won first place in Kindle’s 2013 International Book Competition in the General Fiction category. Her novel MURDER: TAKE THREE, the third book in the detective series she co-writes with former federal prosecutor Marsha Lyons, was a finalist for a 2014 Shamus Award. April’s short fiction has appeared in DASH Literary Journal, the Mark Twain House online magazine, Seven Hills Review, DECASP, Floyd County Moonshine and Hunger Mountain Literary Journal. Things are happening behind the scenes, and the good news is that season four of the Title 18: Word Crimes podcast will start in January! In the meantime, be sure to subscribe to the podcast on iTunes, Stitcher, or whatever podcatching system you use. On this special episode of the Title 18: Word Crimes podcast — and not special like ABC Afterschool Specials from the ’70s and ’80s or that episode of Diff’rent Strokes with First Lady Nancy Reagan — we have two stories. Both stories — “Customer” by S.W. 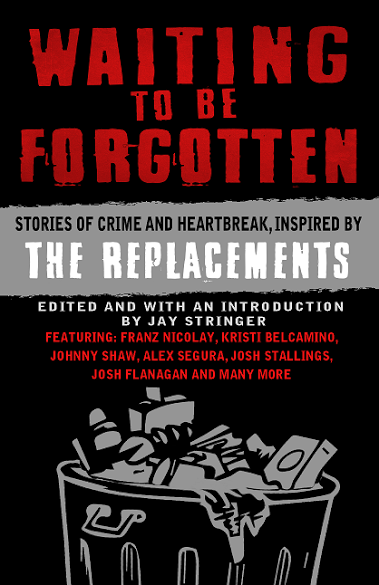 Lauden and “Election Day” by Erik Arneson can be found on the brand new anthology WAITING TO BE FORGOTTEN: Stories of Crime and Heartbreak Inspired by The Replacements. Published by Gutter Books and edited by Jay Stringer, WAITING TO BE FORGOTTEN also features stories by includes 25 stories by David Accampo, Hailey Ardell, Gorman Bechard, Eric Beetner, Kristi Belcamino, Jerry Bloomfield, William Boyle, Angel Luis Colón, Jen Conley, Rory Costello, Josh Flanagan, Ed Kurtz, Tom Leins, Mike McCrary, Franz Nicolay, Rick Ollerman, Eyre Price, Manuel Royal, Alex Segura, Johnny Shaw, Josh Stallings, Jay Stringer, and Liam Sweeney.